We have plenty to be thankful for in Connecticut, including our breweries, but it would be selfish not to show some out-of-state gratitude to our neighbor to the north: Vermont. The land of the maple tree is also the land of many breweries for a state so small. With nearly 3 million fewer people than our state, it has 29 up-and-running breweries compared to our 17, according to the Vermont Brewers Association and CTBeerTrail.net. Maybe it’s the fact that they’re landlocked or have thirstier skiers, but Vermonters support their beer with righteous vigor. They live the motto of “Freedom and Unity.” For example, locals show pride in North Greensboro’s Hill Farmstead Brewery, which RateBeer.com and BeerAdvocate.com gave rare 100 ratings. Like most states, post-Prohibition craft brewing is a recent thing: the oldest functioning brewery is Vermont Pub & Brewery in Burlington, and it’s only 25 years old. What Vermont does well is use artistry to set itself apart from the rest of New England in its dedication to beer diversity, usually on a small scale. Unfortunately for us, most of Vermont’s beers are only available across state lines, including Hill Farmstead beers and the critically revered Heady Topper, a complex and vibrant India pale ale by The Alchemist brewery in Waterbury. What is available is diverse enough to serve as components to each facet of your Thanksgiving meal, or with leftovers. For a mellow opening beer that won’t singe your palate, I recommend Copper Ale from Middlebury brewery Otter Creek. It’s got a faint caramel taste, followed by a hint of bitterness at the end, but everything here is gentle. If you plan to have hors d’oeuvres, especially anything on a cracker, the Cooper Ale would work. Another of Otter Creek’s mellow offerings, Kind Ryed delivers grapefruit that jumps on your tongue for a moment before a quickly retreating. Normally, I’d hold off on IPAs because of their tendency to monopolize non-spicy foods like savory Thanksgiving faire, but Kind Ryed isn’t aggressive, almost to the point that I’d kind of doubt that this beer (made with rye mixed with the barley) should be considered an IPA. From Bridgewater Corners comes Long Trail Brewing’s Double Bag, a hearty, higher-alcohol beer that has a nutty flavor with a slight alcohol burn on the finish when drunk alone. However, it would blend well with cranberry as well as dark meat, nutty stuffing and gravy. Magic Hat of South Burlington makes G-Thing for its winter variety pack and it brings its flavor via ginger juice and cinnamon additives. You could drink it alone or with something spiced like, obviously, gingerbread. Meant for winter, it’s not too early to bring into the Thanksgiving mix. Pairing well with pumpkin pie as well as any chocolate desserts, Heart of Darkness is actually rather crisp for a stout; it’s on another part of the spectrum compared to the soupier Guinness. With hints of burnt coffee and a pinch of bitterness for balance, Heart of Darkness leaves room for desserts to play. I also recommend checking out beers from two more Vermont breweries available in Connecticut: Trout River Lyndonville and Rock Art of Morrisville. A version of this column appeared on Nov. 27, 2013, in the Waterbury (Conn.) Republican-American. 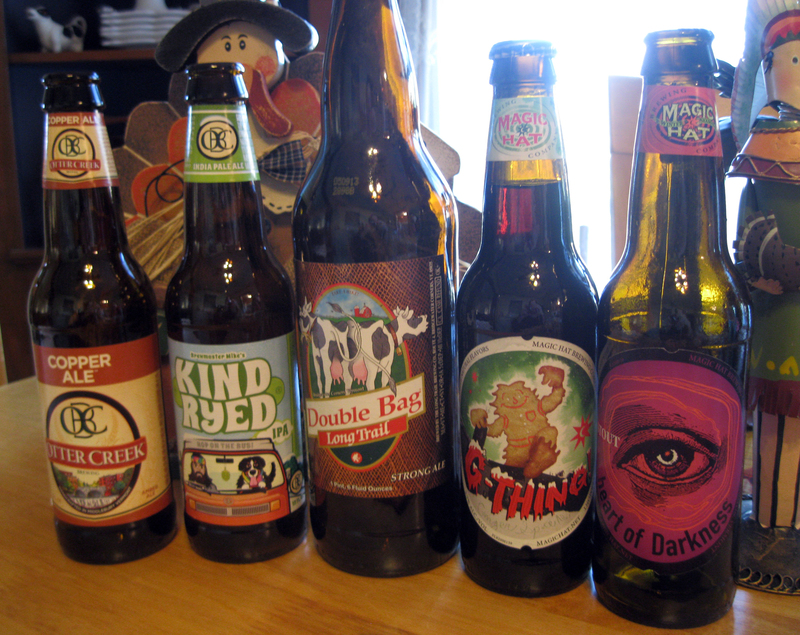 This entry was posted in Beer Snob and tagged Long Trail Brewing, Magic Hat, Otter Creek, Vermont. Bookmark the permalink.